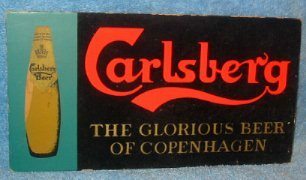 Carlsberg – The Glorious Beer of Copenhagen; 9 1/4 x 5 inch, cardboard, stand-up sign with an easel stand on the back. The black portion of the sign is a felt material. Neat little sign that is older vintage and in very nice overall condition.